Hiya guys! Today I'm sharing the next Sassy Pants Polish 'n' Friends box for the month of June called the Summer Camp Shenanigans. 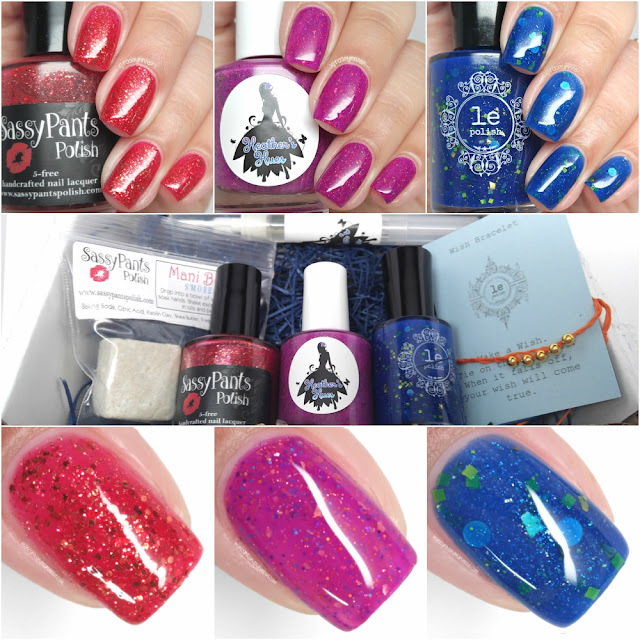 This month the guest indies are Heather's Hues and le Polish, each of them contributing a goodie and a polish. I have been excited about this box ever since I heard about it. Although I never actually got to go camping as a kid since I wasn't allowed to be away from home overnight. But that didn't stop me from watching a bunch of camping movies and let's not forget the classic Friday the 13th, haha. I think my inner geek is showing too much so let's go ahead and get to the box! Summer Camp Shenanigans Box will be launching on June 1st at 2PM CST. The first 10 will be ready to ship and then they will go into pre-order until June 25th, shipping first week of July. Each box retails for $29.99, which includes US shipping. Purchases for the box can only be made through Sassy Pants Polish shop www.sassypantspolish.com. Just like last time, I created an unboxing video for you guys! I really hope you like it. The first half of the video will show you guys everything as I unwrap it. Then the second half of the video will be swatches of each polish. Heather's Hues contribution consists of cuticle oil in chocolate bar scent! I didn't think this would be a scent I would love to wear between swatching (think about it... super sweetness plus acetone fumes...), but I'm happy to say I was dead wrong! The smell of the cuticle oil is very light and not overwhelming at all. The smell also managed to linger for hours on my skin. Please note that the applicator in this box is not one that Heather's Hues usually carries in her store. Which is a total shame because I have fallen head over heels for this felt tip! Sneakin' Back to Camp Before Dawn can be described as a neon violet jelly sprinkled with gold and purple holo micro-glitters and gold micro-flakes. Even though it's described as a jelly, I feel like it has the application of that of a crelly. 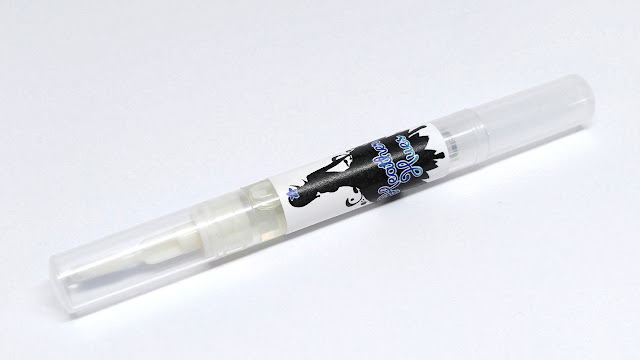 The formula is really smooth and opaque, but not quite a one coater. There is ample glitter in each brush stroke to give full coverage. Due to all the glitters though this will dry to a gritty finish that will need topcoat to smooth out. Shown here in two coats and a glossy topcoat. Resembling the sky... when you're sneaking back in before the counselors realize you haven't been in your bunk all night! le Polish's contribution consists of a true camper tradition... a wish bracelet! There is nothing I love more than crafted jewelry like this, it always feels very boho chic to me. The concept of a wish bracelet is simple, you make a wish and tie it on yourself. 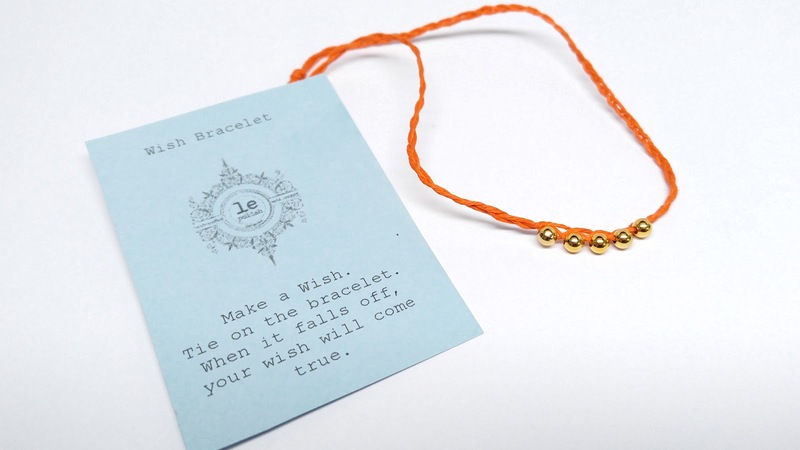 Once the bracelet falls off your wrist on its own, then the wish is supposed to come true. So freaking cute. Tip Your Canoe can be described as a blue jelly full of green and gold glitter and flakes. As a jelly polish, it's a sheer formula but it builds up really well on the nail. It has so many glitters that it makes the consistency a bit on the thick side, but the application is still manageable. There is no need to fish for any of the glitters, not even the larger hex ones. Shown here in two coats and a glossy topcoat. Just like your view from underwater after you fall in the lake! 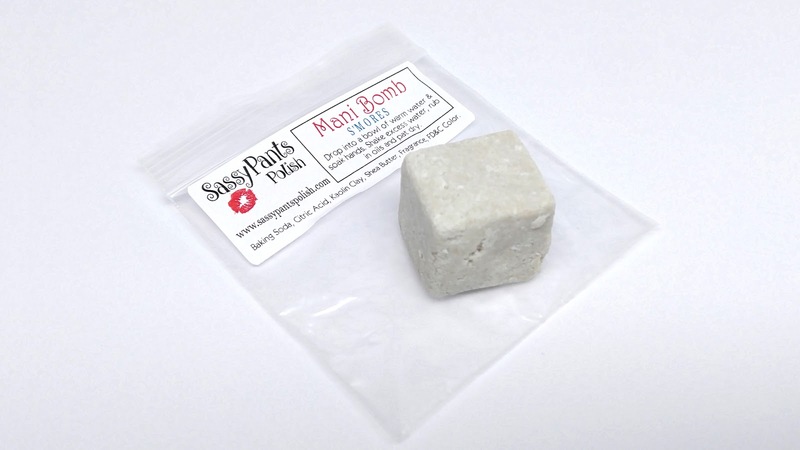 Sassy Pants Polish contribution consists of a marshmallow shaped mani-bomb in the scent of s'mores. I adore the smell of this mani-bomb, it completely smelled like an actual s'more! The sizing is big (and thick) enough to get at least two uses out of it. Ghost Stories Round the Campfire can be described as a dark orange leaning red jelly filled with copper and gold flakes and micro-glitters. Definitely my favorite among the three, the glow of a campfire is so well represented by the combination of the glitters. The application is sheer as expected for a jelly, but does give you complete coverage in just two coats. Again there is ample glitter in each brush stroke so there is no need to dab on any additional coats. Shown here in two coats and a glossy topcoat. Mesmerizing as the flames, burning embers, and terrifying ghost stories told of ill-fated campers of yesteryears. Overall I think you can always sense when a maker has a personal connection to a theme and that is really evident in this box. All three makers managed to capture the essence of summer camp perfectly in each one of their contributions. Not only that, but they managed to create some very unique shades for this time of year. What do you guys think? Do you have any summer camp memories when you see this box and its goodies? To recap, the Summer Camp Shenanigans Box will be launching on June 1st at 2PM CST. The first 10 will be ready to ship and then they will go into pre-order until June 25th, shipping first week of July. Each box retails for $29.99, which includes US shipping. 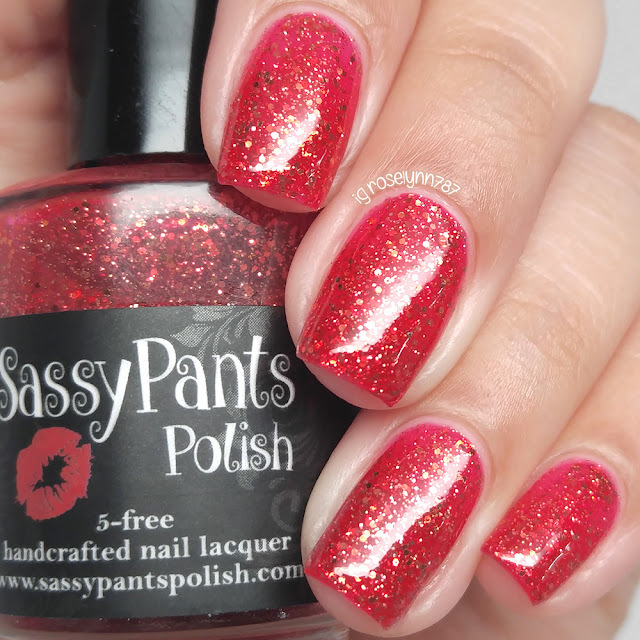 Purchases for the box can only be made through Sassy Pants Polish shop www.sassypantspolish.com. Also the giveaway to win a box before launch is ending in a few hours so if you haven't done so head on over to the rafflecopter to enter. OMG, these are all so grogeous! This collection ROCKS. What an adorable combo! This trio has heart to it. These are all stunning! Her collab boxes are always spot on! I'm loving that LE Polish and Heather's Hues! Beautiful swatches! Gorgeous swatches! I love all 3 of these glittery jellies plus the goodies!